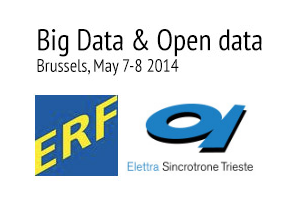 Co-organized by ERF-AISBL (the Association of European level Research Infrastructures Facilities) and Elettra – Sincrotrone Trieste, the Big Data and Open Data Workshop will take place in Bruxelles on May 7th and 8th 2014. The focus of the workshop will be the big data challenge that the Research Infrastructures in all fields of science are facing, and the ways to elaborate solutions. In the afternoon of the second day there will be space dedicated for discussions on specific proposals to be submitted for Horizon 2020.The workshop is meant to attract over 100 highly motivated scientists and facility managers, with speakers that have been selected as high profile experts in the field.All the sessions will be plenary. The workshop venue will be the Royal Museum of Art and History, 100 Parc du Cinquantenaire, 1000 Bruxelles.